We’d love your help. Let us know what’s wrong with this preview of A Red Sun Also Rises by Mark Hodder. A tale of good and evil, where neither is what it seems! Aiden Fleischer, a bookish priest, finds himself transported to an alien world. With him is Miss Clarissa Stark, a crippled hunchback of exceptional ability, wronged by an aristocrat and cast out from society. On the planet Ptallaya, under two bright yellow suns, they encounter the Yatsill, a race of enthusiastic mimi A tale of good and evil, where neither is what it seems! On the planet Ptallaya, under two bright yellow suns, they encounter the Yatsill, a race of enthusiastic mimics who shape their society after impressions picked up from Clarissa's mind. Creating a faux London, the alien creatures enroll Clarissa in their Council of Magicians and Aiden in the City Guard. But why does the peaceful city require guards? After a day that, in earthly terms, has lasted for months, the answer comes, for on this planet without night, a red sun also rises, and brings with it a destructive evil. The Blood Gods! Hideous creatures, they cause Aiden to confront his own internal darkness while trying to protect his friend and his new home. To ask other readers questions about A Red Sun Also Rises, please sign up. If you enjoy the planetary adventures of Edgar Rice Burroughs or Otis Kline then this book is right there with them. Lots of action, fair maidens, and mad scientists on a strange planet with strange inhabitants, then this is one not to miss. A Red Sun Also Rises is a very enjoyable read by Mark Hodder. I was already a fan of Mark Hodder before reading this book. I really enjoy his steampunk style as well as his Burton & Swinburn series. This book is much like his other in that it is steeped in steampunk, twisted with some science fiction, and finally mixed up in history to give it a unique flavor and style. Even though I really did enjoy this book, the characters, and the overall story, it is the deeper themes that make this one special. Red Sun Also Rises tackles the biggest question of all, what is good? What is evil? Does one beget the other? Does that mean that God is inherently evil as well? The story itself is creative in the way that it is told to us. The overall plot revolves around what may be “The Bermuda Triangle.” Aiden Fleischer and Clarissa cross over from a remote island to that of a different planet all together. There they meet fantastical creatures and machines and face countless dangers from the new environment, as well as from dangers within themselves. All the while deep and philosophical conversations and situations move the story forward. I loved the growth of both of our protagonists. Although, it is obvious the way some things will unfold, it does not matter as these are two very identifiable and likable people. Mark Hodder’s writing style is equal to his wonderful imagination. Humor and wit fill the pages right alongside the science and the philosophy. There is a great deal to like in this book for readers of science fiction, fantasy, and even general fiction too. I highly recommend it!!! Now how to explain this book...I do not think I will able too. It's an adventure that you just have to read to truly get. We have a hero and a heroine. Aiden, a priest who is not good at being a priest, and Clarissa, who is so smart but disfigured and therefore she has to beg for bread. But then she starts to work for Aiden, and they discuss religion. A theme through out the book, what is good and evil? Anyway the weirdness has not even started, that starts when he becomes a missionary and we end Now how to explain this book...I do not think I will able too. It's an adventure that you just have to read to truly get. We have a hero and a heroine. Aiden, a priest who is not good at being a priest, and Clarissa, who is so smart but disfigured and therefore she has to beg for bread. But then she starts to work for Aiden, and they discuss religion. A theme through out the book, what is good and evil? Anyway the weirdness has not even started, that starts when he becomes a missionary and we end up with this Alice in Wonderland kind of story. A freaky new world, complex and just really weird. Now I will tell you no more as the worlds needs to be explored on its own. And then you will come to realize things evolve. There is a lot I would like to say, but just think of two people put in a new world. A world that makes no sense at all, and take it from there. You will experience a world like no other. This is a bit unusual book. You get a Victorianesque adventure mixed with science fiction and a dash of romance. Furthermore there is an intelligent story with complex concepts - the name Charles Darwin should give you a hint. For me it was definitely not a book easy to devour. I needed time to get an real understanding of the concepts behind. If possible I would have rated it with 4.5 stars. A corking tale of derring do on an alien world. I love Mark Hodder and this might be my favourite of his to date. 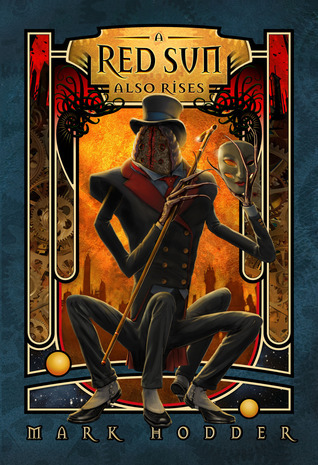 I was expecting another steampunk tale, but this is high Victorianesque, inter-planetary SF. It has more in common with HG Wells than Burton & Swinburn. A Red Sun Also Rises is a first-person narrative, told by Aiden Fleischer, a weak and hopeless sort; a failed vicar turned useless missionary, who becomes a true and selfless hero on an alien world – A world whose civilisation has been, accidentally and unwittingly, completely re-modelled by his companion and former servant, the terribly crippled Clarissa. It’s a terrific story; unique and completely, wonderfully bonkers. The world-building is especially good, complete and well-imagined. The characterisation is superb, the aliens especially, with their caricature Bertie Wooster speech and absurd, Dickensian names - Colonel Momentous Spearjab, Mademoiselle Crockery Clattersmash, Lady Falldown Bruisebad - The good humour and likeability of all the characters is what sets this above others in this genre for me. There are deeper themes, too, a dose of subtle philosophy as Fleischer’s questions his faith, his quest for good in an evil world as he searches for God in the evil around him. I loved the smooth, neat, completely surprising ending – leading into a sequel? I hope so. A Red Sun Also Rises is a cracking planetary romance that involves many of the tropes of Victoriana adventure-romp, whilst also managing to involve an intelligent plot and complex concepts. Much of the start of the book has an HG Wells feel. The tale begins with the story told by Aiden Fleisher, who whilst as a parish vicar in England, develops a friendship with crippled engineering genius Clarissa Stark. When Aiden is forced to leave his parish and become a missionary in Papua New Guinea, Claris A Red Sun Also Rises is a cracking planetary romance that involves many of the tropes of Victoriana adventure-romp, whilst also managing to involve an intelligent plot and complex concepts. Much of the start of the book has an HG Wells feel. The tale begins with the story told by Aiden Fleisher, who whilst as a parish vicar in England, develops a friendship with crippled engineering genius Clarissa Stark. When Aiden is forced to leave his parish and become a missionary in Papua New Guinea, Clarissa goes with him as sexton, and together the two of them have significant difficulties in attempting to persuade the indigenous tribes to convert to Christianity. After a voodoo type ritual, they find themselves transported on the alien world of Ptallaya. This is a strange place, a planet lit by double-yellow- suns called The Eyes of the Saviour, and populated by the Yatsill, a telepathic alien race who, rather like parrots, mimic things they see. We spend much of the book at this point travelling, hunting strange living things with the Yatsill, hallucinating on strange foods and being immersed into the Yatsill culture, which gives us a strange insight into this unusual world. A submersion and ‘rebirth’ of Clarissa in the pools of the Cavern of Immersion means that the Yatsill absorb her life experiences. Consequently, they all speak a rather class-conscious English language peppered with Hear Hear!’s and ‘Harrumphs!’, rename themselves with inappropriate English-sounding names (so that aliens such as Tsillandra Ma’ra become Crockery Clattersmash) and rapidly build Yatsillat, a caricature of Victorian London (one depicted so well on the UK cover) with British idioms such as teashops and the House of Lords. Like writing often found in HG Wells’ novels, it is funny and yet also rather biting, a satire of British Victorian class and society. Summarising this book as a planetary romance may give some readers an impression of frenetic activity with little depth, a legacy of Edgar Rice Burroughs and other Golden Age pulp writers. perhaps. Whilst there is a definite speed to this novel, this is also an intelligent book, with complex ideas riffing off past genre tropes. Like in HG Wells’ stories (First Men in the Moon, for example) or perhaps CS Lewis’ Perelandra space opera novels, although on the surface there is an exciting and quite breathless plot, the real interest in the book is in the sidetracks along the way, rather than the endpoint. The tone of the novel is suitably appropriate. Like writers in the time of the Victorian British Empire, there’s a lot of imperialistic mannerisms that Mark has used that capture a sense of time and place that so many similar novels need to grasp, yet don’t. The book is actually more of an exploration of the concept of evolution, as Mark clearly points out in an interview given at the end of the book. The alien people, plants and animals live in a complex interconnected life-cycle pattern, which is altered as a consequence of unintentional interference. There’s also a lot of discussion of rather esoteric issues, such as the ideas of faith and absolute evil, as Aiden clearly struggles with some of his basic beliefs before reaching a satisfactory conclusion for himself. This initially rather naive character has a number of rites of passage so that by the time he reaches the end of the novel, he has grown and matured as a result of what happens. The ending is a conclusion of sorts, although it is clear that other books could follow. This is, for now at least, standalone and not part of a series. Although the book is similar to the author’s own Burton & Swinburne Adventures, it is not as much of a steampunk tale as the other novels. But overall this is a really entertaining book, by turns, engagingly amusing and then exciting, managing to juggle the scientific romance style of HG Wells and Edgar Rice Burroughs with a knowledge of contemporary SF ideas. All to often, I build my expectations for a book so high that I come away a little disappointed. To my great relief, Hodder’s “A Red Sun Also Rises” met my expectations — and exceeded them. The story is brilliant. I liked the character of Fleischer and I like the thought of a hunchback, Clarissa Stark, helping the pastor develop a spine. Fleischer struggles with his life, his faith, and finally with reality itself, and his human frailty and subsequent growth really pulled me in to the story. The All to often, I build my expectations for a book so high that I come away a little disappointed. To my great relief, Hodder’s “A Red Sun Also Rises” met my expectations — and exceeded them. The story is brilliant. I liked the character of Fleischer and I like the thought of a hunchback, Clarissa Stark, helping the pastor develop a spine. Fleischer struggles with his life, his faith, and finally with reality itself, and his human frailty and subsequent growth really pulled me in to the story. The characters were nicely developed and the world of Ptallaya was freaking brilliant. Frankly, this is a massive disappointment after the first two in the previous trilogy. I was hoping for much better. Unfortunately, this is dire. I hate the language which is sub P G Wodehouse and the cod psychology is deeply annoying. The plot reruns Cycle of Fire by Hal Clement. This review has been hidden because it contains spoilers. To view it, click here. The greatest brilliance to this book is the title, but I could have done without the cover. That weird dapper creature on the front gave me hope and promise of an alien steampunk reality that didn't exist in the first three chapters. Instead of starting off in an outlandish world as you'd expect, you get backstory set in a 1800s household with a conflicted vicar. He and his broken -yet brilliant- companion discuss intently the origins of evil. So instead of aliens and strange places, you get a se The greatest brilliance to this book is the title, but I could have done without the cover. That weird dapper creature on the front gave me hope and promise of an alien steampunk reality that didn't exist in the first three chapters. Instead of starting off in an outlandish world as you'd expect, you get backstory set in a 1800s household with a conflicted vicar. He and his broken -yet brilliant- companion discuss intently the origins of evil. So instead of aliens and strange places, you get a sermon. Once the characters are on the planet though, everything plays beautifully. There are no elongated passages of trivial expose. You learn about the place organically through the experiences of the characters. One trains to be part of the city guard and another becomes a leader of the new city. Then what you thought you knew gets flipped on its head with new meaning, over and over again as the layers peel back (or split open as the case may be). One race leads to another race, and the whole chain comes full circle. That's the bulk of the story without me telling you too much. Of course, the author has to put in his characters conclusions about evil, a very humanistic conclusion too at that, but I didn't understand the need to even have it in there. It was very telling (as opposed to showing). An enjoyable read, reminded me a little of older science fiction that I've read - Lewis Carroll particularly, but other books that I'm less able to put my finger on. A little convoluted at times. I enjoyed it, but at times it was just a little too removed from reality to totally capture my attention. I was intrigued by the cover art and promises of creatures and strange worlds. Unfortunately by the time I got to the creatures, I was so goddamn annoyed by the mc and the story that I had to put the book down. This was an exciting story which started off a little slow, but was well worth the wait! The twists and turns make it an easy read with non-stop action and discovery. So glad it was recommended to me and can't wait to read more from this author! I love Hodder's writing style, and have enjoyed all of his books so far. This one, taking a much more pulpy tack, is reminiscent of Edgar Rice Burroughs, though with a Victorian flair. Action, adventure, weirdness, and a touch or romance. A man without faith. A woman without hope. My name is Aiden Fleischer. I was forced from my home, moved among the victims of Jack the Ripper, was tortured by a witch doctor, and awoke on another planet. Throughout it all, my assistant, Clarissa Stark, remained at my side. On Ptallaya, we were welcomed by the Yatsill. The creatures transformed their society into a bizarre version of our own, and we found a new home beneath the world’s twin suns. But there was darkness in my soul, and as the two yel A man without faith. A woman without hope. … and with it comes an evil more horrifying than any on Earth. Upon their arrival on Ptallya, Aiden and Clarissa meet a strange race called the Yatsill. These enigmatic creatures have the power to telepathically mine thoughts. They use Clarissa as a subject for their powers, and very quickly begin to establish a new order based on her memories of home. A slightly surreal parody of London society springs up almost overnight. This new regime is made up of Aristocrats and the Working Class. Everything initially seems quite idyllic, but as time passes this new society begins to fall apart. The Yatsill are reticent to discuss certain aspects of their culture and there seem to be secrets everywhere. It’s up to Aiden and Clarissa to uncover the truth about their new home. What follows, reads like a marvellous slice of golden age science fiction. What really sold this book for me was the attention to all the little details. One of the best things about the change that comes over the Yatsill, is the new names that they come up with for themselves. Hodder is obviously having a great deal of fun with this particular element of the story. The names are all verging on the absurd, and it’s great to discover them all as each one is slightly more odd than the last. One of my personal favourites was Tendency Clutterfuss. Best character name ever? Could well be. In addition to the amusing names, the Yatsill all start speaking terribly proper English. There is a colonel who is part of the Yatsill military who is all bluster and outraged exclamations. I have to admit a certain fondness for phrases like ‘tally ho‘ or ‘by jove‘. That sort of language always reminds me of George MacDonald Fraser’s iconic creation, Flashman. It’s very strange to hear that particular lexicon coming out of the mouth of an alien-being, but within the confines of this story it totally works. It’s nice to see the evolution of the relationship between Aiden and Clarissa. On Earth, they are very much bound by the constraints of Victorian society, but once they find themselves elsewhere things change quite dramatically. Aiden is also forced to face his inner demons, and starts to better understand himself and the nature of humanity. I wasn’t expecting quite this level of introspection in the characters, but it works well and helps flesh out the context of the main narrative. I seldom find a science fiction story that tempts me of late. Since Harry Potter combined aspects of science fantasy and adventure, the attention of authors--or at least what publishers give us--seems to have been diverted from that genre. I did enjoy the series of Jack Campbell's Lost Fleet galaxy wars, suggested by a student two years ago. The chess game both inside and outside the battleship was as good as Orson Scott Card's two Ender books, Ender's Game and Ender's Shadow. Those two series, however, are not new to readers. So I was as surprised as anyone to find myself borrowing Hodder's Sun from the display of new books at my local public library last week, perhaps because of the title's similarity to Hemingway's The Sun Also Rises, which I'd read years ago. The book begins in England, in the summer of 1885, with two main characters, both outcasts in different ways. Protagonist Aiden Fleischer had chosen to be an Anglican clergyman like his father, hoping to find a similar comfort in his work, but discovers he despises being a priest. Clarissa Stark is a deformed woman, her body broken by an autocarriage, who Aiden hires as a housekeeper. Shaken by a chance occurrence and a naive mishap, he flees London to become a missionary in the Melanesian Islands. After reaching the Melanesian Islands, he and Clarissa Stark find themselves on the planet Ptallaya where the sky holds four small dark moons, two bright yellow suns, and hosts the Yatsill. These somewhat crustacean-like people are eager mimics who quickly reshape their society based on telepathic images of Victorian London received from Clarissa. Though not front and center, the story is ultimately about good and evil, taking responsibility for facing one's failings and learning courage and commitment. Not unlike The Sun Also Rises, which I reread on finishing this. I enjoyed being a newcomer to this world, trying to work out how the environment functioned, discovering the welter of life forms, and learning to make familiar all the differences (much like attending a cultural event for a people of whom I had had a deep ignorance). And at various turns of the plot, discovering a new context for previous information which put the lie to my earlier understanding. A fan of utopian/dystopian novels, I particularly like the various societies, each an offspring of the planet itself, its weather, and the presence of other races. In particular I enjoyed the brief description of Zull culture on page 229, faint memories of which seemed to live on other life forms. Though relatively short, A Red Sun Also Rises is an ambitious book, worth reading. - Hodder's imagination and descriptive writing are great. The early period on the alien world are particularly compelling, and the image of the world that changes when the Red Sun rises positively chills the bones. - The pacing of the novel, though, is a bit uneven for my taste. Somewhere around the 2/3 mark, it seems like he decided he needed to finish the book and suddenly shifted into action and excitement. The result is that the civilizations and characters revealed in this last section get short shrift, narratively. - I appreciated the moral and ethical courage our protagonist grows into, but I was less pleased with the war part that made up the last bit of the book. It felt tacked on. - At its heart, A Red Sun Also Rises develops an environmental argument about the relationship of people to the world around them and challenges us to re-think how we understand what we've done to nature. The civilizations in the book don't know what they're doing, but the crucial failings they've created spring from their misunderstanding of the world around them. Let's hope we gain a bit more perspective than do the aliens here. - This book reminded me of two older works. First, Edgar Wright Burrows' A Princess of Mars also includes a regular (if superlative) man being transported to a famous and strange other world where they show themselves to be capable and useful leaders whom the inhabitants of the world would be wise to follow. Second, the wraparound story recalls stories like Poe's "The Unparalleled Adventure of One Hans Pfaall," which purport to depict real--if unbelievable--events through journals or papers found mysteriously. I am not a fan of Mark Hodder. I have no recollection or knowledge of his previous books. However, by the stir and circumstance of the moment, this book was prominently displayed at my local library. The cover garnered my interest thus my rental. I am not disappointed. The story itself is very straight-forward in expression but comes off with no direction through most of the book. It opens up with the main character Aiden Fletcher and how he works as a priest despite not being a good one. Through I am not a fan of Mark Hodder. I have no recollection or knowledge of his previous books. However, by the stir and circumstance of the moment, this book was prominently displayed at my local library. The cover garnered my interest thus my rental. I am not disappointed. The story itself is very straight-forward in expression but comes off with no direction through most of the book. It opens up with the main character Aiden Fletcher and how he works as a priest despite not being a good one. Through his work in the clergy, two things happen. First, he falls in love with a girl named Alice who happens to manipulate and control his movements through manipulation and blackmail. The other, and more important girl, he meets is Clarissa Stark who becomes his ward and assistant in the clergy. She is a hunchback with twisted legs but still works hard. Because of situations, both Aiden and Clarissa leave their own town and through some supernatural events, end up on a new world where the the inhabitants are four-legged creatures with a vertical slit for a mouth, bumps on their head, and other features which are shown on the cover of the book. Without expressing much of the story, what I like to say is there is a lot of psychological and religious discussion and undertones in the story. I am not sure if Mark Hodder is an atheist but a lot of the writing kind of points to the possibility of him expressing atheism yet it may just be the character-trait of one of the characters since nothing is expressed about Hodder's personal beliefs. There also seems to be a lot of expression on Darwinism too. Now as a book, I don't mind this part to be entertaining since it is a fictitious book. However, for those who are sensitive on faith, this part needed to be expressed. Mark Hodder is a very clever writer. He specialises in alternate histories that, broadly speaking, come under the heading of Steampunk. He's probably best known for his Burton and Swinburne series, which brilliantly sets up Victorian explorer and academic Richard Burton, aided by decadent poet Algernon Swinburne, as a sort of steam age James Bond tackling enemies of the Empire in a futuristic Victorian setting. "A Red Sun Also Rises" (not part of the Burton & Swinburne series) is an obvious h Mark Hodder is a very clever writer. He specialises in alternate histories that, broadly speaking, come under the heading of Steampunk. He's probably best known for his Burton and Swinburne series, which brilliantly sets up Victorian explorer and academic Richard Burton, aided by decadent poet Algernon Swinburne, as a sort of steam age James Bond tackling enemies of the Empire in a futuristic Victorian setting. "A Red Sun Also Rises" (not part of the Burton & Swinburne series) is an obvious homage to the works of Edgar Rice Burroughs and, in particular, his John Carter of Mars series of books, though there are also nods to the works of Jules Verne and H.G. Wells, among others. The story centres on Aiden Fleischer, a vicar in a sleepy country town. He's a vicar simply because his father was and his own failure of faith is one of the books themes. He befriends and takes in an almost blind cripple, Clarissa Stark, who becomes his companion and closest friend. When they are sent as missionaries to a south pacific island the story really starts to take off, as they're transported to a distant planet where the natives create their own bizarre version of Victorian London. Mark Hodder came to my attention with his Burton & Swinburne trilogy, which featured an alternate-reality Sir Richard Burton and his compatriot, the dissolute poet Algernon Swinburne, exploring mysteries of time travel and alternate realities. The books were fascinating and exceptionally enjoyable, so I jumped on this when I saw it on the library shelf. I was not disappointed. A self-contained novel (I think - I suppose it's possible Hodder could be working on a sequel), it sets forth the pe Mark Hodder came to my attention with his Burton & Swinburne trilogy, which featured an alternate-reality Sir Richard Burton and his compatriot, the dissolute poet Algernon Swinburne, exploring mysteries of time travel and alternate realities. The books were fascinating and exceptionally enjoyable, so I jumped on this when I saw it on the library shelf. I was not disappointed. A self-contained novel (I think - I suppose it's possible Hodder could be working on a sequel), it sets forth the personal journal of Aiden Fleischer, a self-doubting Anglican missionary to the South Pacific in the late 19th century. From the island of Koluwai, Fleischer and his companion, the physically deformed but brilliant Clarissa Stark, find themselves transported to a strange other world whose sentient inhabitants adapt their entire civilization to images of Victorian England drawn from Clarissa's mind. The two must unravel the mysteries of this bizarre world, where the days take Earth years, and when the twin yellow suns set, a single giant red sun rises and everything transforms. The book is a solid adventure story. There's a fair amount of humor, particularly as the native Yatsill - who look like large upright mussel shells with four legs and two arms - take on the characteristics and vocal mannerisms of late 19th-century Londoners. But the absurdity masks a really compelling mystery, which consists of layer upon layer. What I had thought was the central mystery of the alien world was revealed by the midpoint of the book, and there was much more beyond. Aiden Fleisher and Clarissa Stark will stay in my mind for a while yet, how could they not with the way this story unfolds? It was a rollercoaster of emotions to read and I am all the more happier to have experienced it. By the end of this journey we have everything we could have wanted from from it...well, almost. Usually, it would make me upset to leave off a story in such a way. Not with this one. The ending makes you think, which fits in quite nicely with the entirety of its content. As the Aiden Fleisher and Clarissa Stark will stay in my mind for a while yet, how could they not with the way this story unfolds? As the reader we not only get to see a foreign world of aliens, politics, our protagonists' questions of what is good and evil that are the driving force of character development and of a keener outlook on reality that will leave you questioning your own development. A good, old-fashioned adventure tale with a bit of steam-punk and the threat of alien invasion thrown in. Our Victorian-era heroes, a failed priest/missionary and his brilliant-but-disabled female sidekick, while trying to convert some natives on a far off island find themselves transported to an alien world with some very strange and almost comical inhabitants called the Yatsill. The Yatsill, resembling four-legged molluscs, are brilliant mimics and soon pick up the mannerisms and thoughts of th A good, old-fashioned adventure tale with a bit of steam-punk and the threat of alien invasion thrown in. Our Victorian-era heroes, a failed priest/missionary and his brilliant-but-disabled female sidekick, while trying to convert some natives on a far off island find themselves transported to an alien world with some very strange and almost comical inhabitants called the Yatsill. The Yatsill, resembling four-legged molluscs, are brilliant mimics and soon pick up the mannerisms and thoughts of the two and so begin to rebuild their city and their culture in the style of Victorian London. However, it's not long before this seeming idyll gets shaken up and our heroes are plunged into a dastardly plot involving blood gods, horned demons, submarines, sonar weapons and alien invasion. I guess if I had to sum up this book in one word it would be...interesting. I know it's not a very good word, but it's the one that pops up in my mind the most. It's just basically a story of two people who get transported to an alien world and have to live with the weirdness there. The scenery and alien world described is really cool, and if you like the kinds of adventure where people are thrust into a new world and have to cope with all the strange oddities there, it's a pretty good book for y I guess if I had to sum up this book in one word it would be...interesting. I know it's not a very good word, but it's the one that pops up in my mind the most. It's just basically a story of two people who get transported to an alien world and have to live with the weirdness there. The scenery and alien world described is really cool, and if you like the kinds of adventure where people are thrust into a new world and have to cope with all the strange oddities there, it's a pretty good book for you. I think my biggest complaint is that it's not really a theme-heavy and there's not a really of inner character progression, but I feel like that's more of a personal thing. It focuses more on the outside traits of the world than inner growth. There's some personal growth hinted with (slight spoiler) Aidan wondering about his inner demons but there's not a lot of emphasis on it. Yet another entry in the "books that started out well but went off the rails" category. (Maybe I should just make it a category.) I'm not sure steampunk is the right word; it's certainly weird. I picked this up because the book I was looking for wasn't on the shelf. It looked interesting. And it started that way. Bishop in Edwardian England, mysterious woman who is disfigured yet really smart and interesting, traveling to a distant land, sent to another planet. So far...yes. But it got a little Yet another entry in the "books that started out well but went off the rails" category. (Maybe I should just make it a category.) I'm not sure steampunk is the right word; it's certainly weird. But it got a little Old Skool SF feel - back when the emphasis was naming fantastic things rather than plot. There are a *lot* of names. And then they all change their names. And things happen, none of which make a whole lot of sense. There might be a jab on communism (in a book published in 2012?? ), but there's certainly a lot of .... things. This is a social commentary through the lens of an alien culture type of book. There is a halfway decent narrative on the nature of good and evil that runs through it as well. A departure from Mark Hodder's Burton & Swinburne series, he tackles deeper issues and gives Victorian culture a backstage seat (although it is, of course, still present). The main character, Aiden Fleischer, spends the first half of the book being an insufferable weenie. Luckily his companion, miss Clarissa Stark, is q This is a social commentary through the lens of an alien culture type of book. There is a halfway decent narrative on the nature of good and evil that runs through it as well. A departure from Mark Hodder's Burton & Swinburne series, he tackles deeper issues and gives Victorian culture a backstage seat (although it is, of course, still present). British writer living in Valencia, Spain. Becoming the father of twins really slowed my writing down for three years. However, I'm happy to report that it's now returning to its former pace ... high time I got something new into the bookshops. I'm currently working on the final edit of a new SF novel which is the first in what I hope will be a massive new series. To find out more about it, read a p British writer living in Valencia, Spain.